The 4th Annual Catholic Women’s Conference will be held on April 27th, 2019. The mission of the Catholic Women’s Conference is to foster an appreciation for the personal dignity of women in Christ, and to encourage women to use their feminine gifts to transform the family and society. Our goal is to provide our attendees with a Spa Day for the Soul. For more information and registration visit us online at HelenaCWC.com or call Judy at (406) 594-1455. 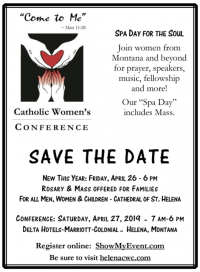 "Join with women from around the Northwest for the fourth annual Catholic Women’s Conference on Saturday, April 27th at the Civic Center in Helena, Montana. Speakers include Patty Schneier, Mary Ann Kuharski and Sister Maria Regina Immaculata. There will be a special luncheon presentation: “The Centrality of Women in the Family” presented by Amy Eickert; and Caitlyn Van Hanssen. The conference will include a mass at the Cathedral of St. Helena, opportunities for Reconciliation: Adoration of the Blessed Sacrament; and a Rosary. There will be coffee, tea, and goodies in addition to the luncheon.